How to Enjoy Travelling Inside Canada? Live, travel, and be happy. Ride the rails! The largest country in North America and the second largest country in the world, Canada is extremely vast. Replete with untouched natural splendor, blend of different cultures and rich history, the mesmerizing country drives millions of holidaymakers to dig for low-cost tickets for flights to Canada. Canada boasts over 500 airports and about 800 unpaved landing strips. The country is well connected to the UK and there is no dearth of direct flights to Canada. Major airlines like British Airways, Air Canada, and Air Transit operate over 40 flights from London to Toronto every day. Air Canada offers a direct flight from London to Calgary, Montreal, Vancouver, and Halifax while British Airways serves to Montreal and Vancouver. Due to the sprawling area of Canada, it may be an onerous job to move around the region. There are numerous modes of transport like planes, cars, buses, and trains at one’s disposal, but it is essential for one to get acquainted with a right way of utilizing these. Air travel is the best option to get around the sprawling country. Flying between the different cities of Canada is comparatively cheaper than bus or train. The country is brimming with numerous airlines that ensure comfortable and fast travel. Air Canada is a major national carrier that has the largest network. The carrier also offers most frequent schedules for travelers on a Canadian tour. Apart from this, there are many other companies like Air Transat, Zoom and discount airline West Jet that make for a perfect choice to trip the country. If you are sharing the costs with others, then renting a car in Canada is undeniably an economical alternative. One can find countless companies, strewn all over the country, that offer cheap car rentals. But one has to stay conscious of all the rules and regulations. Heed the traffic rules while driving into Canada and keep your home driver’s license, registration papers of a vehicle and proof of insurance. Gasoline is not cheap in Canada and it is sold on the basis of a liter. There are several points along the border where the Canadian highway system directly links with the continental USA. Canada has two major highway routes cross Canada east to west. 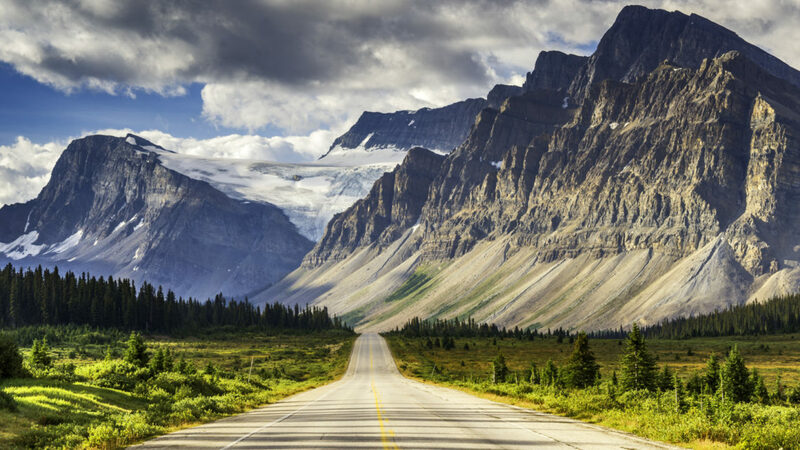 Highway 1 is a four-lane Trans-Canada Highway (TCH) that links over 10 provinces of Canada and runs from Victoria (British Columbia) to St. John’s, Newfoundland. The other one is Yellowhead Highway (Hwy. 16) that connects Winnipeg to Prince Rupert. Holidaymakers traveling on cheap flights to Canada can also make use of intercity buses available between major metropolises. Best services are provided within the Quebec City ” Windsor Corridor. Coach Canada is one of the best bus services in Southeastern Ontario and Southern Quebec that provide safe travel. The popular one is Greyhound that Canada that offers great services and covers the Toronto – Ottawa route, the Montreal – Ottawa route and between Toronto and south-western Ontario. Orleans Express is another effective alternative that offers secure bus services for travelers hopping on flights to Canada. In Canada, the license of running a particular route is given to only one company and there is no competition among providers. Most of the companies charge higher prices for the services. Last but not the least, vacationers taking flights to Canada can also avail the country’s passenger rail services. A train ride is the finest mode for travelers having a penchant for scenic vistas. The three-day train ride between Toronto and Vancouver that passes through the magnificent Canadian prairies and the Rocky Mountains. Traveling by train is quite expensive and consumes much longer than car or plane. It is better to make preparations ahead of time in order to get the lower fares.